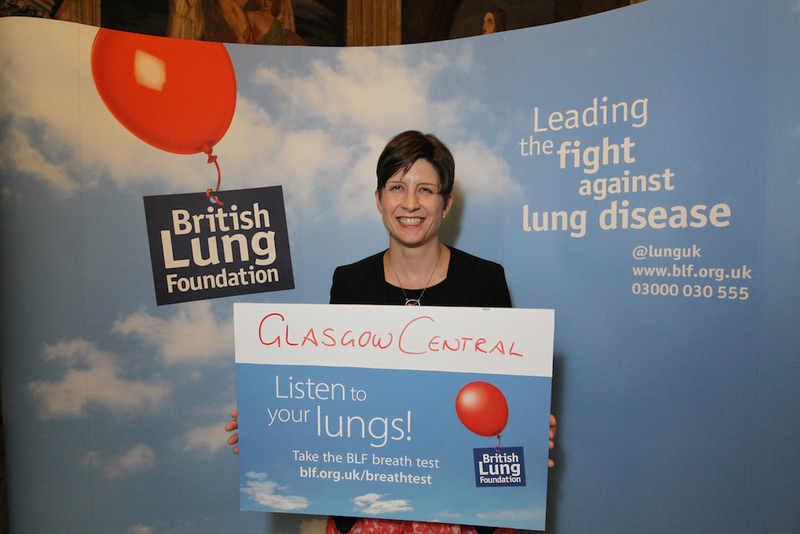 Alison Thewliss, MP for Glasgow Central, is supporting the British Lung Foundation’s upcoming lung health awareness campaign, taking part in an online ‘breath test’ in the Houses of Parliament on 5th July, and encouraging others to do the same. During a week-long exhibition at Westminster, the charity will showcase their upcoming Listen to your lungs campaign, due to start in Mid-July. The UK-wide campaign will aim to raise awareness that feeling out of breath doing everyday tasks could be a sign of lung disease. Public Health Minister, Jane Ellison MP launched the exhibition and ‘breath test’ on 4th July. The exhibition gives MPs, Peers and visitors to parliament a chance find out more about lung disease in the UK and to test their lung health using an online ‘breath test’, displayed on an interactive display donated by technology company MultiTaction. The test allows people to check their lung health through a 10 simple questions, based around the Medical Research Council breathlessness scale. The aim is to reassure people who don’t have a problem and guide those with significant breathlessness to make an appointment with their GP. “Completing the BLF’s online ‘breath test’ is a really easy way of checking your lung health. I’d encourage everyone to try it. It’ll either give you peace of mind or start you on a path to helping you manage your breathlessness. “This parliamentary exhibition gives us a chance to heighten awareness amongst Scottish MPs about the respiratory health challenges affecting many of their constituents in Scotland. BLF Scotland is pushing for change and has asked for a National Lung Improvement Plan for Scotland to halt the increase of lung disease and to see a long term, sustainable improvement in Scotland’s lung health.